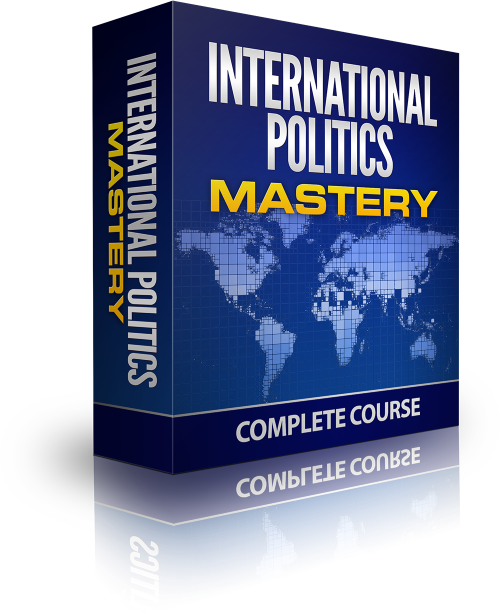 You are about to learn powerful, expert-level skills to understand and speak about most problems of international politics like a confident expert even without prior university education in Politics or International Relations. Trump, Brexit, terrorism... There is so much happening in the world. And whether we like it or not, we are constantly flooded with news headlines, giving us the illusion of understanding what's really happening. In reality, rather than getting more clarity and understanding, we become more confused. We read a headline, and we don’t have the time to process it, because we are very soon exposed to a new headline, with even more up-to-date piece of information. Our understanding does not deepen. Our horizons do not widen. The focus is on speed rather than nutrition of the information we consume. The headlines have to be short and tell us the key message, because very likely we will not read the rest of the story. We don’t have the time to do this, because there is yet another headline just a scroll away. So the information presented to us is fragmented. Different pieces are disconnected. For example, the coverage of world politics focuses too often on individuals and personalities, just to make the story more interesting. "Facts are not the same as knowledge or ability—and on the Internet, they’re not even always facts "
What you mostly get by following the news are the simple facts of what happens, when, and who is involved. Why political leaders act the way they do? Why do states continue to act in certain ways even though we know from history that wars never bring any good? Why wars and conflicts continue to erupt regularly? Why issues such as Brexit develop in this particular way? Were they inevitable? What are the connections between different problems? Over the many years of researching and teaching international politics, I am now convinced that these questions are 100 times more important than the simple ‘what happened and when’ kind of information. Through this course, you will gain access to state-of-the-art, research-informed tuition delivered through highly-engaging and easy-to-follow video lectures and practical exercises, equivalent to one university-level module worth at least £1125 (based on UK university tuition fees). Specific theories and concepts which will allow you to take most problems of international politics, such as Trump's foreign policy or Brexit, and speak about them confidently with more depth and understanding. How the so-called 'Levels of Analysis' framework can enable you to fill the gaps left by most news stories you will read on the Internet. The working basics of the three most fundamental Theories of International Relations, so that you can incorporate the principles of those theories to your arguments, or you can spot when others operate with those theories even without realizing it. How to skyrocket the impact of your arguments with concepts like: system level, anarchy, balance of power, realism, liberalism, norms and values, social construction, bureaucratic behavior, cognitive biases. Very specific, word-for-word examples of how you can instantly apply your powerful new knowledge to write and speak about international politics topics which interest you. How to take what you are about to learn in this course and start using it instantly. To that end, in addition to illustrating each point with examples throughout the course, I have also prepared a number of case studies concerning some of the timeliest and most pressing international problems, including Islamic terrorism, Brexit and Trump’s foreign policy. The university-level material which any teacher will take as a clear sign of your excellent preparation for the discussion or assessment. The analytical framework which will automatically take your blog, articles or comments to the next level, demonstrating that you are indeed an expert. How powerful but at the same time unacknowledged the concept of ‘anarchy’ is. It is truly a ‘silent hero’ of international politics! How the seemingly boring idea of ‘bureaucracy’ can tell you significant things about how foreign policy develops. How people think and act differently when working in groups, and what disastrous consequences this may have for foreign policy decisions. The biases we all share, including Simplification Bias, Consistency Bias and Poor Estimation Bias, which can fundamentally impact foreign policy and international politics. An ability to recognize the missing bits from the media coverage of international politics and to explain what is missing to other people. What books to read thanks to my Recommended Reading List, so that you can keep educating yourself with the right literature and really take your skills to the next level. This is a live course, in a sense that I will be adding new video lessons, exercises and case studies regularly. I will be adding new video lessons because new and exciting research on international politics is produced every day. I know what it is, because it's both my work and my passion to know it. Having a lifetime access to this course will allow you to stay up to date, so that you can regularly learn new skills and further deepen your understanding. I will also be adding new case studies, so that the course covers most of the hot-button issues of the day. Seeing how I apply the framework explained in this course will give you more confidence to do it yourself. I promise that the tuition in this course is of the highest quality, based on genuine university-level research. It is presented in a highly-accessible and engaging way, designed specifically for those who do not have prior university degree in Politics or International Relations. I invite you to send me a message if you have any questions about the content of this course. This is the first course of this kind and I am committed to make it as useful for you as possible. So please feel free to get in touch with suggestions on how I can improve this course. After successfully completing the entire course, you will be able to receive a Certificate of Completion, specifying the content of the course. I'm Kamil Zwolski, PhD. I'm Associate Professor in International Politics at the University of Southampton, UK, and a Fellow of the UK’s Higher Education Academy, which promotes teaching excellence. I've got over 10 years experience of research and teaching in International Relations. I am currently working on my second book, which concerns European - Russian relations following the recent conflict in Ukraine. My research articles are published regularly in some of the world's leading academic journals. I teach hundreds of students every year, and in 2015 my efforts were recognized with a prestigious Vice-Chancellor’s Teaching Award for innovation in teaching international politics. I am always friendly and approachable for my students, because I admire everyone open to learning new knowledge and skills. José Martín Galván (Research Lawyer on Human Rights): "A course that explains in a logical and accessible, the various phenomena to consider the foreign policy of nations. With a review of the main currents of thought and international events that reflected in the development of international politics." Tudor Vilcan, PhD: "This course is a great introduction to the world of International Relations for students and all those interested. The distinct contribution of Dr. Zwolski here relates to providing a clear and systematic map of the discipline, which, as many know, can be very abstract and unnecessarily opaque at times. Another important aspect in this course is the focus on the applicability of the insights for the student. Many times International Relations scholars are accused of being self-indulgent, and doing theory for the sake of it. This course takes a necessary step in addressing this deficit, especially as International Relations, as a discipline, finds itself in competition with many other frameworks for understanding and explaining the world. This course is therefore recommended for all those who want to ask questions about the world of international relations in a rigurous manner, informed by an adequate theoretical grounding and whom are eager to understand how to connect arguments to evidence. Needless to say, it feels that this task is becoming exceedingly urgent in the (evidence and theory free) world of Trump and Brexit." Patrick Howell, MA Psychology: "The teacher is a well-versed expert on the topic. I've only recently started the course, but his thoughtful approach to the material and its delivery is very obvious. I'm finding the course to be educational and very engaging. I will update my review as I make more progress in the program." Speak about most problems of international politics like a confident expert even if they have never studied Politics or International Relations at a university. Educate others about how to properly understand and analyse issues like Donald Trump's foreign policy, Brexit or Islamic terrorism. Build complex arguments using theories and concepts such as system level, anarchy, balance of power, realism, liberalism, norms and values, social construction, bureaucratic behaviour, cognitive biases, and many more. Critically assess the value of the daily news they read and watch. Completely transform, with my Bonus Lecture and the Reading List, the way they approach their interest in international politics. Individuals interested in the problems of international politics, particularly those who regularly watch the news, read newspapers or follow on-line media. Commentators, bloggers and journalists covering international politics. Students of Politics and International Relations who want to consolidate their knowledge and improve their grades. Policy practitioners who want to improve their analytical skills and better understand the context of their policy activities. I am Associate Professor in International Politics at the University of Southampton, UK, and a Fellow of the UK’s Higher Education Academy, which promotes teaching excellence. I've got over 10 years experience of research and teaching in International Relations. I am currently working on my second book, which concerns European - Russian relations following the recent conflict in Ukraine. My research articles are published regularly in some of the world's leading academic journals. I teach hundreds of students every year, and in 2015 my efforts were recognized with a prestigious Vice-Chancellor’s Teaching Award for innovation in teaching international politics. I am always friendly and approachable for my students, because I admire everyone open to learning new knowledge and skills.